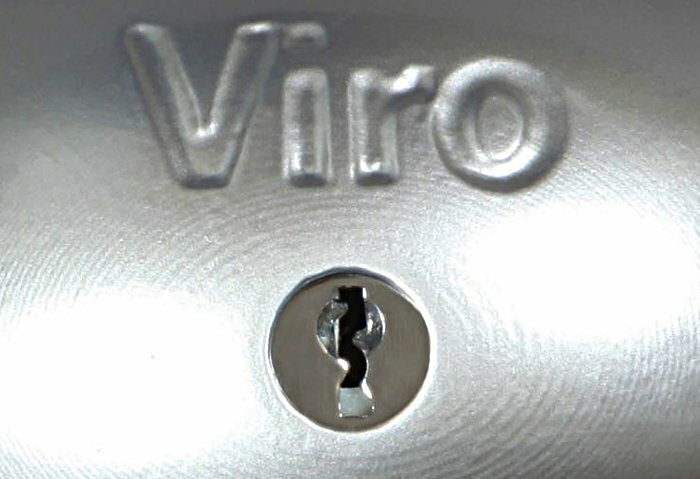 The enhanced security provided compared with the weak locks installed as standard is only the most obvious advantage of the “Viro Van Lock”. When evaluating the installation of an additional lock it is important to also bear in mind other factors, such as the ease of everyday use, reliability over time and versatility. The body, which is made entirely of a single piece of stainless steel, provides an enormous resistance against attempts to break it and it is practically impossible to grip with burglary tools as it is elliptical in shape , with no sharp edges, which prevents any attempts to grip it. 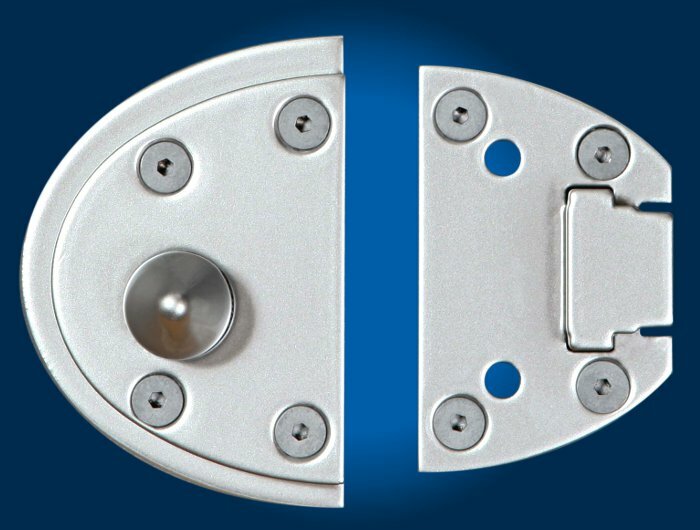 The fixing system uses 10 anchor points, comprising aluminium rivets and stainless steel screws (supplied), in order to maximise resistance to attempts to pull the lock from the door. 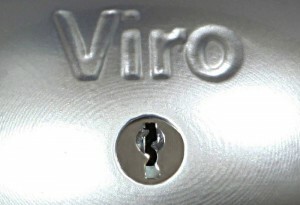 The “Viro Van Lock” fixing system uses 10 anchor points, comprising screws and rivets, to prevent pulling. 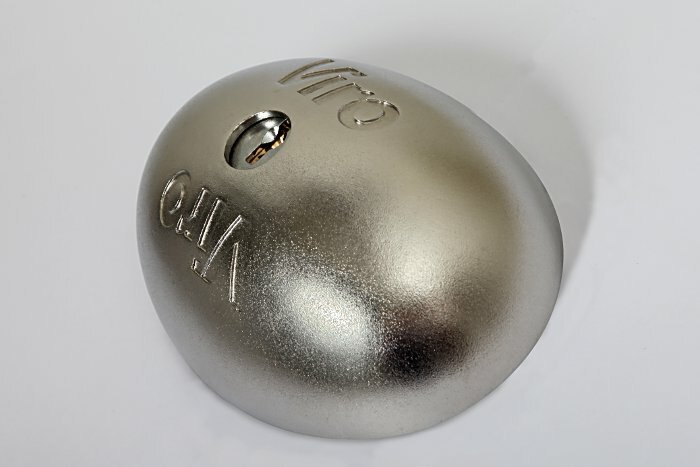 The closing system is created in such a way as to be particularly resistant to attempts to open with crowbars and hammers: it consists of a lever made of case-hardened, tempered and galvanized steel which engages on a sturdy, conical, stainless steel pin. 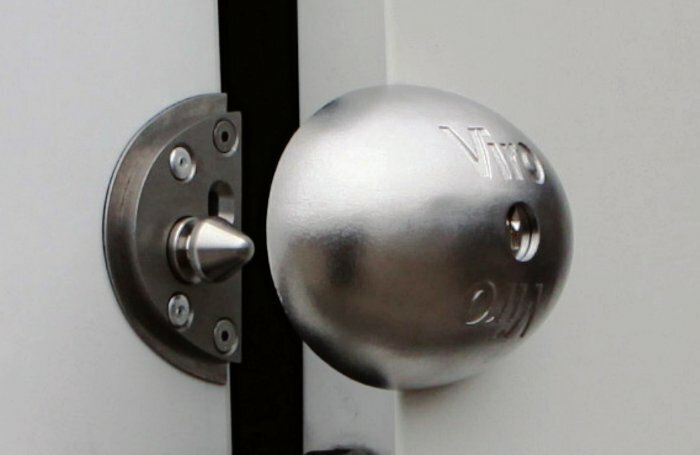 The “Viro Van Lock” closing system uses a sturdy, conical, stainless steel pin. In the hole one can see the lever made of case-hardened, tempered and galvanized steel which engages on a conical, stainless steel pin. The lock is particularly difficult to open with the lock picking technique as it uses 7 pins, compared with 5 pins used on normal padlocks, so it is extremely complicated to align them all simultaneously, and it is fitted with pins with a special “mushroom” shape which tend to get stuck under the action of a lock pick. Lastly, it adopts the Viro Top Security profile which makes it more difficult to introduce and operate the picks. Any attempts to drill the lock are effectively countered by an anti-drill plate made of case-hardened, tempered and galvanized steel. Ant-drill plate to protect the “Viro Van Lock” lock. 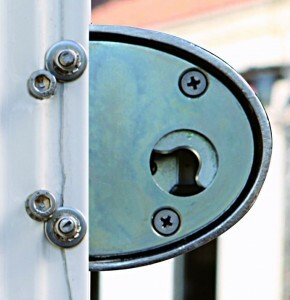 A potential weak point of an additional lock is the internal release system, which is necessary in the case where the operator is accidentally locked inside the loading compartment. Since it is fairly easy to drill the sheet panels of the doors, if one is able to introduce a hook through the hole with which to grasp the internal release it is possible to open the lock. But, unlike other systems that use wires with eyelets that which one can grasp with a hook, the internal release system of the Viro Van Lock uses a round knob which is almost impossible to grasp from the outside, and a protective shield at the exit point of the wire. The internal safety release of the Viro Van Lock cannot be grasped from the outside. 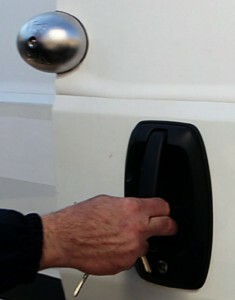 The “Viro Van Lock” is not only much more resistant to attacks compared to a common padlock but it is also much easier to use, because when it is opened it remains attached to a door of the van and there is therefore no need to remove it and replace it every time that the door is opened. 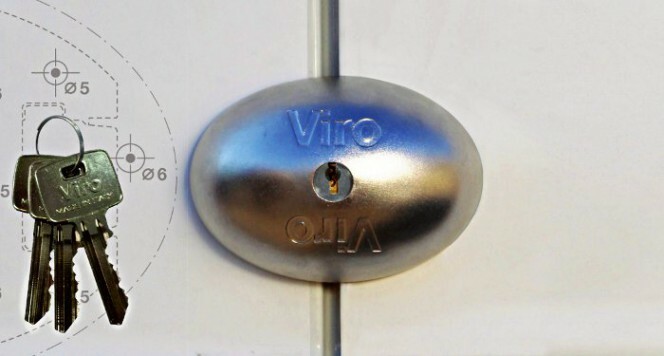 The convenience of the “Viro Van Lock” is that it remains attached to the door when the door is opened, so there is therefore no need to fit it and remove it every time. There is also no need to reclose it once it is opened, as it closes automatically by closing the door on which it is fitted and one cannot leave it open because the key can only be removed if the “Van Lock” is closed. If, on the other hand, it is necessary to keep the lock always open this can be done with the key inserted and fully turned. Even the key is easy to use, because it has a very large grip, which is easy to handle, even when wearing work gloves. 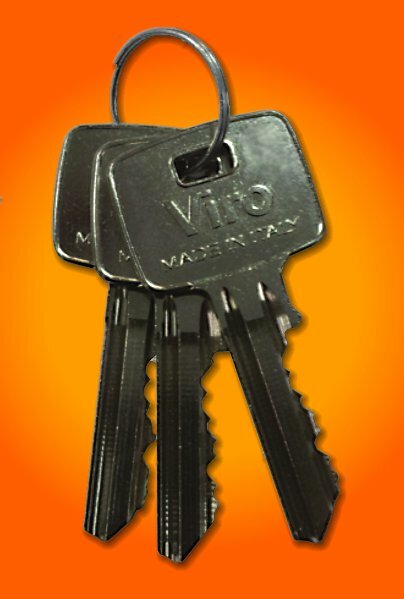 The keys have a large grip so that they can be easily handled even when wearing work gloves. 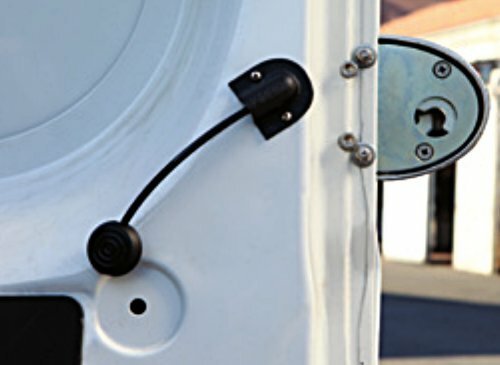 Lastly, thanks to the internal safety release system, it is impossible to remain accidentally closed inside the load compartment, since the lock opens from the inside simply by pulling the special wire fitted with a knob. The closing system tolerates vertical or horizontal misalignment of the doors of up to 4 mm, so, for this reason, it is able to operate satisfactorily and for a long time even if the hinges and the doors of the vans suffer wear and deformations following prolonged use. The external one-piece body made of stainless steel is rust proof, as are the springs of the pins, so as to withstand the harsh weather conditions which a lock fitted to a means of transport will inevitably be subjected to. The internal cylinder, the pins and the counter-pins are made of brass so as to always guarantee maximum reliability when coupling with the key, which is made of nickel-plated brass. If necessary, it is also possible to replace just the cylinder, without changing the entire lock. 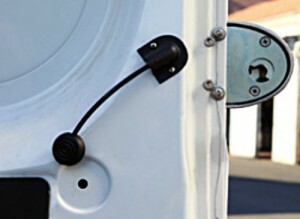 “Viro Van Lock” can be fitted either on the rear doors, the side door or both doors. In the latter case, pairs of locks can be purchased which open with the same key (KA system). For particular requirements, one can request all the special designs for the cylinder, such as the master key systems (MK). “Viro Van Lock” can be used either on the rear door or on the side door. The plates are attached to the doors using the rivets and screws provided, using the holes just drilled and placing the anti-scratch gasket and any shims which are necessary (also provided) between the plates and the bodywork. Lastly, as appearances count, the Viro Van Lock is also pleasing to the eye: it is perfectly solid, it does not shake, and so does not ruin the bodywork, it does not rust, its colour does not fade and it fits in well with the design of the van. 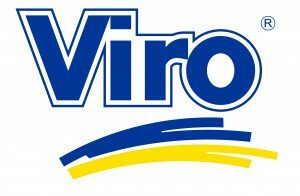 “Viro Van Lock” is pleasing to look at and does not ruin the bodywork. 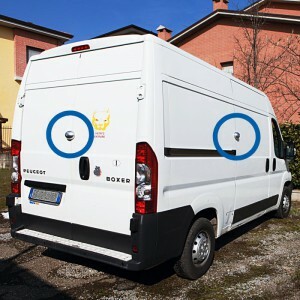 So, with the “Viro Van Lock”, not only can we protect our van and its contents, but we can so without sacrificing practicality and aesthetics! This entry was posted in No category, Padlocks and tagged products on 17 March 2014 by Mara Rossi.